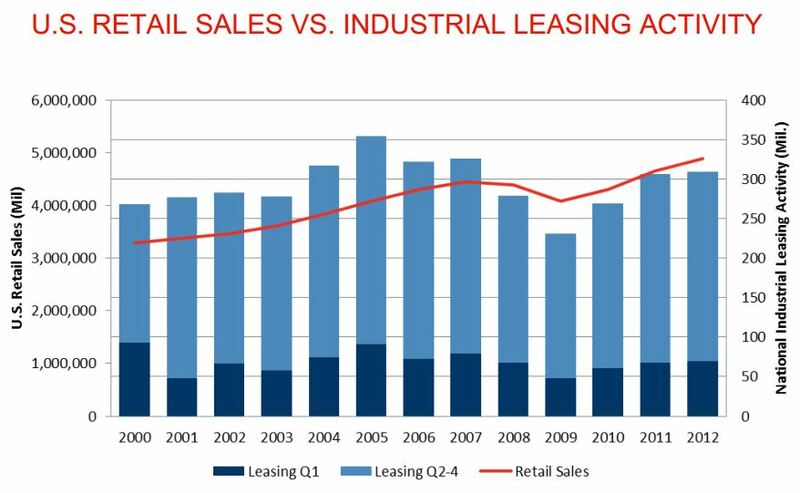 As the above graph shows, there is a strong correlation between U.S. retail sales and U.S. industrial leasing activity. Retail sales continued to rise and totaled $1.3 trillion in the first quarter, an increase of 3.8% over this time last year. Although the economic backdrop continues to slowly improve, consumer confidence remains low. Consumer confidence levels lagged first quarter, dropping 7.0% from this time last year. Contributing to the rise in retail sales, over the last few years, e-commerce grew faster on a year-to-year percent change basis than total economic activity. E-commerce growth for Manufacturers, Retailers, and Selected Service businesses significantly outpaced overall economic activity in their respective sectors. U.S. leasing activity during the first three months of the year for C&W markets measured 93.2 msf. Four major U.S. markets (Greater Los Angeles, CA; Chicago, IL; Inland Empire, CA; and Dallas, TX) reported leasing activity greater than 5.0 msf first quarter. Positive absorption is expected to continue in the coming quarters and the current forecast bodes well for the economic climate. * Source – Moody’s Analytics, U.S. Census Bureau, Cushman & Wakefield Research. Only markets tracked by Cushman & Wakefield offices are included in this analysis.